Purified water, glycerol, propylene glycol, hydroxyethylcellulose, lactic acid, chocolate flavor. Mastrelle® Amour Chocolate, lubricant gel is indicated for rapid relief of vaginal dryness at any age and of any etiology (hormonal imbalance, age, stress, anxiety, certain drugs). 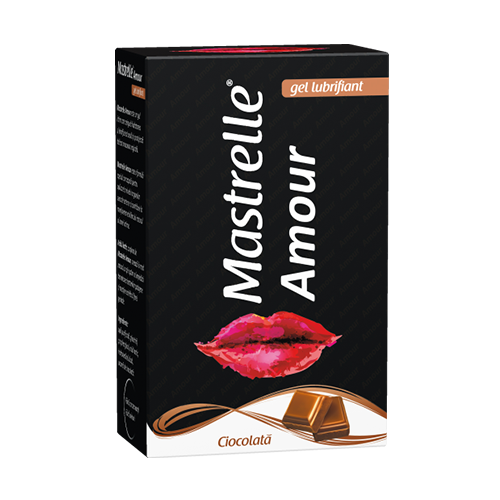 Mastrelle® Amour Chocolate, lubricant gel re-establish the balance of vaginal mucosa and maintains a natural pH that ensure the best environment for normal healthy bacterial flora to develop. A cardboard box containing a recipient of 50 gel and instructions for use. Mastrelle® Amour Chocolate, lubricant gel is a class I medical device in accordance with the European Directive for medical devices 93/42/EEC.